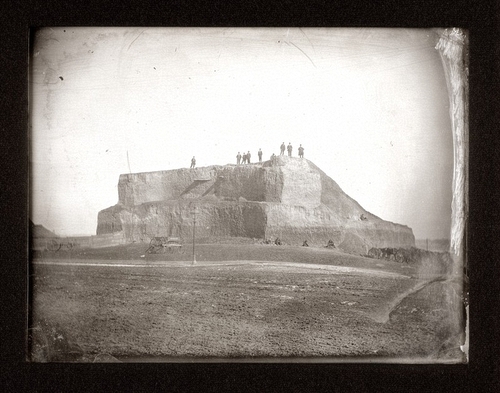 Description: The Big Mound, looking east from Fifth and Mound Streets. Nine men stand on top of the mound, one in a top hat, while one sits on the mound near the bottom, and three men and a woman sit at the base. Horses with wagons stand off to the left, and one wagon sits in front of the mound with "Morton and Clark" printed on its back. A streetlamp stands along the road.